We are pleased to announce our new Central Agency of 21,47 meters 4 cabin Abacus 70 motor yacht SAKURA for luxury crewed charters in Turkey and Greek Islands. Length Overall : 21,47 m.
Cabin Details : 4 cabins; 1 master cabin, 1 VIP cabin, 1 twin cabin, 1 cabin with upper/lower bunks. SAKURA “Abacus 70” is a luxury type Fly-Bridge designed by the famous architect Fulvio de Simoni. Represents the best philosophy of the yard, a perfect synthesis of the latest generation design, functionality, comfort and performance, with large spaces that allow you to live aboard the medium long periods. The purity and the elegant simplicity of the lines outside are renewed in the design of the windows stretched forward following the leitmotif of the range Abacus Marine, offering a view to its full immersion into the sea. The Abacus 70 is a further confirmation of Italian excellence. 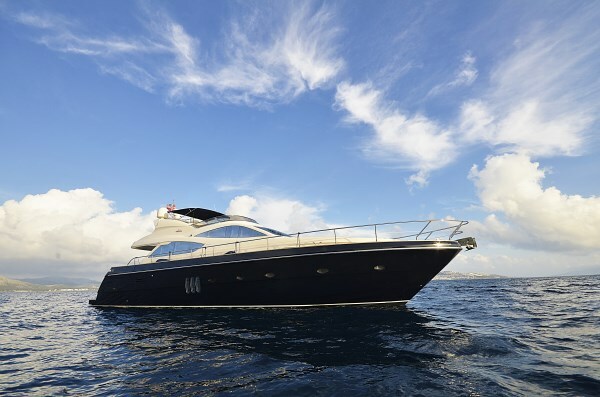 Please do not hesitate to contact us for more details about motor yacht SAKURA and other alternatives available for charter in Turkey, Greece and Croatia. Even if you are unsure about the specifics your dream entails, our skilled professionals are experienced at helping customers fill in the pieces. Just send fill the form below with the subject or call us from +90 216 3368484 and let 4U Yachting custom tailor your experience for you. Shake off the winter chills and plan your Yacht Charter in Turkey, Greece or CroatiaShake off the winter chills and give yourself something to look forward to by planning your Yacht Charter in Turkey, Greece or Croatia this summer.